To understand the symbolic and allegorical meanings of Toho’s kaiju films, the context out of which they arose must be understood. Japan, the most industrialized and Westernized nation in Asia during the first half of this century (the only non-Western member of the Council of the League of Nations) found itself in a disadvantageous position at that time. Completely dependent upon imports of raw materials for survival, Japan recognized that access to those materials in Asia was controlled by the Western colonial powers. Other than Japan, only China was not under the direct control of a Western power. Too large to be subdued by any single power, China had been left open to all (including Japan) for exploitation. In the 1930s, Japan sought to expand its role in China with a goal of eventual control, at a cost of worsened relations with the United States, Japan’s largest trading partner. Unable to subdue China and defeated by the Soviet Union in border clashes, Japan turned its attention to the Pacific. Germany’s initial successes in World War II brought about the defeat of some European colonial powers (such as France and the Netherlands) together with the near defeat of England and the Soviet Union. In july of 1941, when the United States (then the world’s leading producer of oil) placed an oil embargo on Japan, the Japanese were faced with a choice: accede to US demands (in effect, surrendering without a fight) or go to war with a chance, however small, of achieving victory, Not surprisingly, Japan chose war. Contrary to the claims of wartime US propaganda which reverberates to this day, Japan had no intention of conquering the world or even the US. Japan’s strategy was to create a self-sufficient, expanded Empire (the Greater East Asia Co-Prosperity Sphere) which would encompass the raw materials needed for survival. Japanese naval and air units operating out of island fortresses would lure the US Navy into battle and defeat it, while US ground forces would be repelled by the same island fortresses. The US would be forced to negotiate a peace settlement which would recognize Japan’s hegemony in Asia. But as Emperor Hirohito announced on August 15, 1945, the war had “developed not necessarily to [Japan’s] advantage.” After spectacular early successes, it was the Japanese Navy that was eventually destroyed while the island fortresses were either conquered or bypassed. Japanese cities were obliterated by the US Air Force in a series of raids. Japan was reduced to reliance upon a last ditch kamikaze defense of the home islands, which would cause so many US casualties that a favorable peace might still be obtained; the atomic bombing of Hiroshima and Nagasaki ended that illusion. For the first time in over a thousand years, Japan had lost a war. 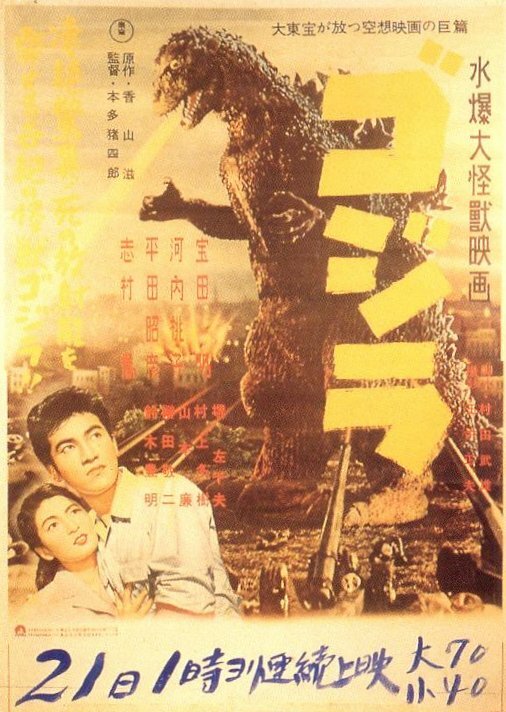 The first kaiju eiga, Godzilla, King of the Monsters (Gojira, 1954), is a stark reenactment of the Second World War. Three of the men central to the film’s creation had each been involved in the war. The director, Ishiro Honda, had served in the Imperial Army in China where he was taken prisoner. Eiji Tsuburaya, director of special effects, had mastered his techniques with miniatures while making reenactments of naval battles for propaganda films, reenactments so successful that during and after the war they were often mistaken for actual combat footage. The film’s music composer, Akira Ifukube, had written marches for the Imperial Army and Navy. In the movie they made, Godzilla represents more than the A-Bomb; Godzilla is the United States itself. Godzilla’s very name emphasizes the monster’s foreign nature. Gojira, as he is called in Japan, has his name spelled in katakana, the written characters used in Japan to represent foreign words. The katakana rendering could easily have been written as the hiragana spelling instead. The course of Gojira follows the war in the Pacific as seen from the eyes of an ordinary Japanese. At first, there are reports of ships sunk, representing Japan’s naval defeats and the destruction of its merchant marine fleet by US submarines. The government debates releasing this news, just as the wartime government heavily censored the reports of such defeats as Midway. The ship losses are disturbing, but not immediately threatening. Then Godzilla emerges on Oda Island, which stands for all the islands lost to the US, in particular Okinawa, the closest. Godzilla/US now threatens Japan directly. The monster’s attack on Tokyo mirrors the destruction wrought by the US Air Forces. Japan’s armed forces are helpless against the power of Godzilla. Japan’s fighter planes drive back Godzilla temporarily, but clearly without harming the kaiju. Unlike the real war, this allegorical one ends with a Japanese victory as Dr. Serizawa’s kamikaze attack in Tokyo Bay destroys the enemy. Yet the real threat presented by the US was not defeated and continued to be depicted in subsequent films. Godzilla Raids Again (Gojira no Gyakushu. 1955) depicts not the Second World War, but the new Cold War and its implications for Japan. Imagery of the Cold War abounds in the film, which takes place in winter; snow and ice are used as visual clues to the film’s concerns. Here Godzilla once more represents the US, with a new monster, Angilas, appearing as the USSR. Godzilla and Angilas begin fighting on an island north of Japan, representing the Sakhalin Islands which were and are a source of friction between Japan and the USSR. The two kaiju then bring their battle to Japan, causing horrific damage. Angilas/USSR is defeated, a defeat which leaves Japan at the mercy of Godzilla/US. Japanese pilots, veterans of the Pacific War, defeat Godzilla/US, with Kobayashi’s attack playing a prominent role in the victory. The next Godzilla film, King Kong vs. Godzilla (Kingu Kongu tai Gojira, 1963), is rightly seen as an East vs. West battle; however, the combatants do not represent the sides that most people in the West assume. In King Kong vs. Godzilla, we again find a merging of Cold War and Second World war concerns. The film begins with a US nuclear submarine causing the heating up of the Cold war as Godzilla/US is freed from an iceberg. The Soviet Union does not play a major role in the film; this is primarily a Japan vs. US battle. Godzilla’s first attack is against a Soviet military base in the Sakhalin Islands (the tanks are clearly marked with the Red Star of the Soviet Army). Godzilla/US easily defeats the Russians and moves towards Japan. King Kong has been assumed to represent the West, but such is not the case. Kong’s meaning goes back to Japan’s goal in the Second World War. Kong is the natural resources of the Pacific Islands brought to Japan to enable that country to defeat the West. Other than name, nothing in the film connects Kong to the West. He is not intended to be the same Kong as in the original 1933 film, nor if he were would his symbolic role be altered. Understanding this sheds light on a long-standing rumor about the film. 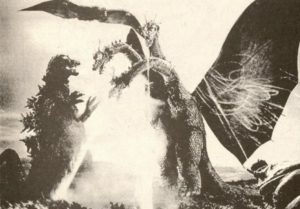 Whether intended as a publicity stunt or a joke by Forry Ackerman of Famous Monsters magazine, the false story that there were two endings (Kong winning in the West, Godzilla in the Asian version) was believed by American audiences and is still repeated today. Believing as they do that Kong represents the US, it makes sense to American audiences that Japan’s champion, Godzilla, would win in the Asian version. From a Japanese perspective, however, such an e nding would not make sense; Kong’s victory is a Japanese triumph because Godzilla represents the US. If an alternative Western ending had been filmed, Godzilla would have been shown swimming away leaving Kong submerged, the significance of which not likely to have been appreciated by American audiences. The theme of Pacific resources had been explored earlier in a non-Godzilla film, Mothra (Mothra, 1961). In this film, the Rolisicans (thinly veiled Americans) bring destruction to Japan by their misuse of the Pacific resources. Note that these resources (Mothra), arriving in Japan in larval form, are “manufactured” in the heat-ray cocoon scene and then released to attack New Kirk City (New York). Japanese participation is required to restore order in the Pacific, shown by the return of the Fairies to Mothra. The message is clear: the Pacific is best managed by Japan, not the West. The Mothra/Pacific theme is reprised in Godzilla vs. The Thing (Mothra tai Gojira, 1964) with some interesting misgivings. Concern is expressed over the exploitation of the giant egg/Pacific resources by unscrupulous Japanese businessmen. Even so, despite Mothra’s protests, the egg is not returned to Infant Island. Although capable of causing great destruction, Mothra accepts this decision and returns home peacefully. The arrival of Godzilla/US calls for the use of the Pacific resources to achieve Japanese victory. The adult Mothra’s kamikaze attack weakens Godzilla, enabling the fresh resources represented by the larvae to defeat Godzilla. Understanding the symbolic nature of Godzilla in Godzilla vs. The Thing helps explain one of the curious differences between the Japanese and American versions of the film. In what is known as the Frontier Missile sequence, the US Navy attacks Godzilla as the kaiju is walking along the shore. This sequence is absent from the Japanese version (see Godzilla In America). On its face, there seems to be no reason for the absence of this sequence, as the special effects are on a par with the high standard set by Eiji Tsuburaya in this film. 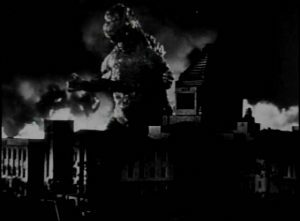 Symbolically, however, the scene makes no sense as Godzilla is the US, rendering the sequence unusable in the Japanese version. For American audiences, to whom the help of the US Navy in its Japanese ally’s battle appears natural, the Frontier Missile sequence does not cause any confusion. Significant in the Japanese titles of both King Kong tai Gojira and Mothra tai Gojira is Godzilla’s second billing. This is logical as in both films the top-billed kaiju represent Japan with Godzilla remaining as the threatening US. One of the few kaiju films to refer directly to the Second World War, Frankenstein Conquers the World (Frankenstein tai Chitei Kaiju, Baragon, 1965) presents an intriguing and somewhat disturbing view. The film begins with the transfer of the Frankenstein monster’s heart from Germany to Japan during the war via submarine. (On a historical note, such transfers did take place, usually of advanced German weapons and blueprints in exchange for raw materials. The last such transfer, attempted by the German submarine 0-234, included, among other items, an Me262 jet fighter packed in crates and a number of lead containers filled with uranium for use in Japan’s nuclear weapons research. The war in Europe ended while 0-234 was still under way and the German sub surrendered; the two Japanese officers on board committed suicide.) The heart arrives in Hiroshima where it is subjected to the A-bomb attack. 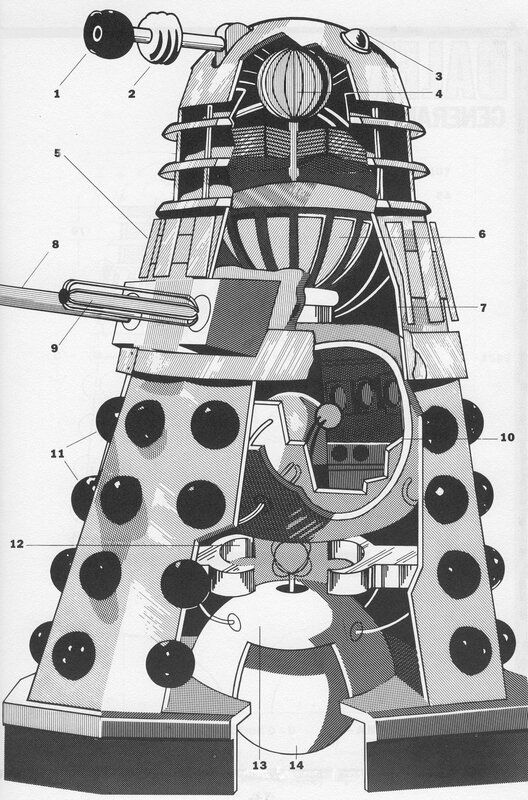 This combination of a Nazi heart with American technology produces not a fearful monster, but a benevolent one who defends Japan from Baragon. 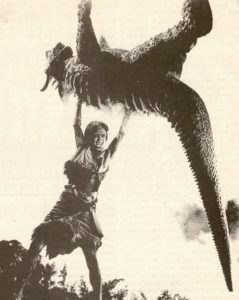 In the original script, Baragon’s role was to be played by Godzilla, the change being made because the on-screen time was felt to be too short for Godzilla. The symbolism did not change. Baragon represents the US, defeated by a Japanese-German alliance as symbolized by the Frankenstein monster. Over time, Godzilla’s symbolic role began to change, representing different perspectives of Japan’s relationship with the US. Increased acceptance of the US as Japan’s friend and ally, coupled with an increasing identification of Godzilla as a Japanese symbol would ultimately lead to a role reversal for the kaiju. In Ghidrah, the Three-Headed Monster (Sandai Kaiju: Chikyu Saidai No Kess 1964) a new threat arises: China, which had recently exploded its first atomic bomb, thus entering the ranks of the superpowers. The view of Japan depicted in Ghidrah is that of a tiny nation surrounded by large, dangerous ones. Again, Mothra represents the resources of the Pacific used in Japan’s defense. Mothra will help Japan immediately upon request although such help is no longer sufficient by itself. Japan’s infant military status vis a vis the nuclear powers is emphasized by the depiction of Mothra throughout the film in the larval stage. Godzilla continues to represent the US, while Rodan assumes the role of the USSR. Japan’s image of these two are a bleak one. Godzilla and Rodan are interested only in fighting each other, unconcerned about any collateral damage suffered by Japan; after all, they say they have “had trouble” with Japan in the past. Even the threat of a resurgent Ghidrah/China does not rouse them to action. Only when they are shamed/inspired by Mothra’s hopeless, kamikaze-style attack against Ghidorah do Godzilla and Rodan stop fighting each other to help fight Ghidorah. Ghidorah’s large size and power represents the Japanese fear of the size and proximity of a nuclear-armed China, a threat more deadly than that of the US. The film ends with the disappearance of the Western kaiju Godzilla and Rodan. Only the Asian kaiju, Mothra and Ghidorah, are seen alive at the film’s conclusion. Monster Zero (Kaiju Daisenso, 1965) portrays Godzilla/US in a new light, one that is returned to in Destroy All Monsters (Kaiju Soshingeki, 1968). In these two films Godzilla/US is seen as a powerful force, not necessarily destructive, but which could without warning come under the control of leaders inimical to Japan. Both films find order restored when these controlling forces, rather than Godzilla, are defeated. To Japan, it is the unpredictable US government that is the threat now, not the essentially neutral nation itself. A more dramatic shift in Godzilla’s symbolic nature begins in Godzilla vs. The Sea Monster (Nankai no Daiketto, 1966) and continues throughout the remainder (excepting Destroy All Monsters) of the original series. In the original story for Godzilla vs. the Sea Monster, King Kong, not Godzilla, was the main kaiju. This substitution could take place because Godzilla had by that time become a symbol of Japan for Japanese audiences. In this film, it is Godzilla, who represents the natural resources of the Pacific used by Japan to fight Red Bambo/China, just as later these resources would be used to fight Hedora in Godzilla vs. the Smog Monster (Gojira tai Hedora, 1971). This is made clear by the association of Godzilla with the Pacific Islands in Godzilla vs. Sea Monster, Son of Godzilla (Gojira no Mosuko, 1967), and even Godzilla’s Revenge (All Kaiju Daishingeki, 1969). Monster Island (as first introduced in Destroy All Monsters) is an explicit representation of this concept. Note that Angilas in Godzilla on Monster Island (Gojira tai Gigan, 1972) still represents a foreign power (either the US or the USSR). Angilas is easily defeated by the Japanese Self Defense Forces when he first arrives in Japan. Only when accompanied by Godzilla’s presence/approval can Angilas enter Japan. Japan may require outside help, but it will fight its own battles now. By the time of Godzilla vs. Megalon (Gojira tai Megaro, 1973), Godzilla has become simply an asset to be drawn upon in times of need. Godzilla vs. the Cosmic Monster (Gojira tai Mechagojira, 1974) finalizes the transformation of Godzilla from an image of the US to one of the Pacific resources. Filmed at a time of increasing Japanese protests over the American presence on Okinawa (protests that would lead to the return of Okinawa to Japanese sovereignty), Godzilla vs. the Cosmic Monster is a latent depiction of East vs. West tensions. The Japanese view of an overly materialistic, soulless West is represented by MechaGodzilla. Angilas/USSR is quickly defeated by the technologically superior US. King Seesar represents the spiritual values of the East which combine with the resources of the Pacific to destroy MechaGodzilla and the enemy military base on Okinawa. This East vs. West battle is continued in Terror of MechaGodzilla (Mechagojira no Gyakushu, 1975). Here, Titanosaurus represents the misuse of the Pacific resources when placed in the wrong hands. MechaGodzilla is again the US, while Godzilla continues as a resource on call. That the West is not to be trusted is shown by Dr. Mafune’s misguided cooperation with the West leading to destruction in Japan and his own and his daughter Katsura’s deaths. The futility of Westem-style reliance on technology alone is depicted by MechaGodzilla’s helplessness once deprived of Katsura’s human guidance (soul). One final time, a kamikaze attack (Katsura’s suicide) brings about the defeat of the West. Terror of MechaGodzilla brings us to the end of the war generations’ Godzilla films. The new series films, beginning with Godzilla 1985 (Gojira, 1984), are the products of a post-war generation and deserving of a separate analysis. Nothing in this article should be seen as an indictment of the Japanese in general or the makers of the Godzilla films in particular as a warmongering, anti-US people obsessed with their defeat in the Second World War. The article’s purpose is to demonstrate how films reflect the concerns of the culture that produces them. Japan is a resource-poor small nation surrounded by powerful countries that have been or could be enemies. That Japanese films deal with this on a symbolic level should be of no surprise. To a Japanese audience, a kaiju film in which the kaiju is defeated by an imported opponent is as natural as it would be unnatural to a US audience to see an American movie in which the monster is defeated with help from Mexico or Canada. Horror and science fiction films address the fears of their audience. By comparison, US monsters of the pre-World War II era such as Dracula, Frankenstein’s Monster and the Wolfman (and even Kong) are killers, like gangsters or murderers. Dangerous to individuals, they are no threat to the nation itself. The rise of Nazi Germany and worsening relations with Japan in the 1930s was reflected in serials such as Flash Gordon. Yet even in those, the US is safe. The menace is far away and dealt with by Flash, who directs the actions of local allies near the source of the trouble. The US does not have to mobilize its aimed forces to deal with Ming the Merciless. Not until the post-war period is the US faced for the first time with an enemy, the USSR, that is seen as having the power to defeat or even destroy America. This threat was reflected in movies such as Them! and War of the Worlds, wherein the monsters have the power to defeat the US. 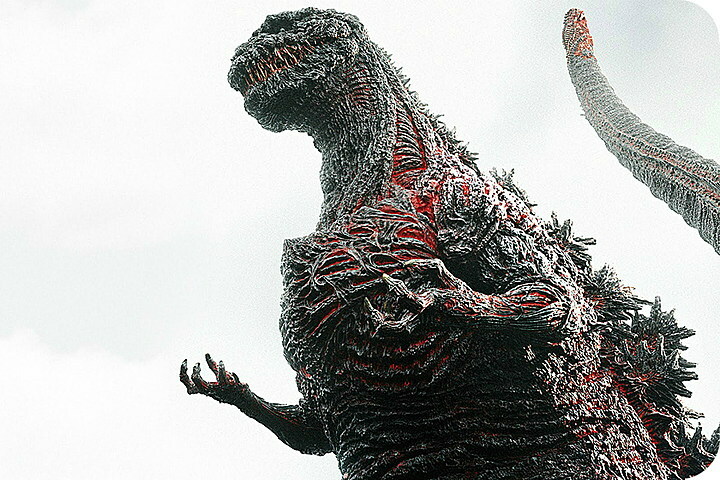 Popular movies intended for general audiences, such as the Godzilla films, are often ignored by serious main-stream critics. Yet it is in these that we can most often find the fears of those audiences being displayed and resolved at a symbolic remove. No one in Japan was ever worried about an attack by a giant mutated Tyrannosaurus Rex, but the concerns about defeat in war and nuclear attack were all too real.